Bill Nelson, has published the “The Most Complete History of Directory Services You Will Ever Find” (until the next one comes along), a detailed history of LDAP based directory services and products. Expect a few updates as people find about this and ask for adding new data points. But this is the most complete summary I’m aware of. 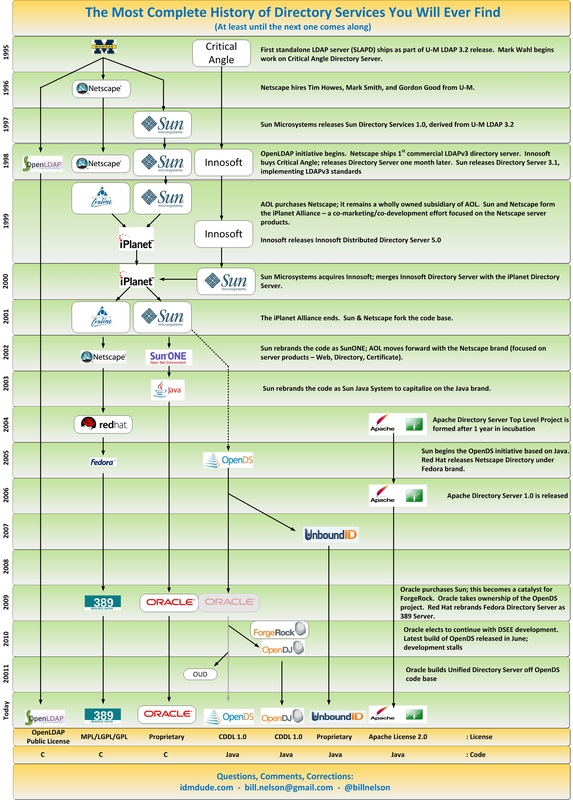 I had a timeline of Sun directory products a few years ago, but Bill’s has more details. His post includes a visual timeline of the directory service products and their heritage, linked here under, for your convenience. Click on the picture for a full size image. Personally, I’ve been involved with the Sun and derived lines since 1996, and now drive the ForgeRock one: OpenDJ ! Last week-end all Sun products documentation got moved from docs.sun.com to Oracle.com domain, with new IDs. So all URLs and bookmarks have been “lost in translation” ! But I managed to find the place where the Sun Directory Server documentation is listed, from iPlanet Directory Server 4.11 to the latest Oracle Directory Server Enterprise Edition 11g : the Legacy Sun Identity Management Documentation. There are link for both the online and the PDF versions. Here, you will also find access to the OpenSSO enterprise 8.0 documentation as well as Sun OpenDS one. Pfew! I was afraid everything disappeared. On a side note, classifying the so called “strategic” Oracle Directory Server Enterprise Edition 11g in the legacy products seems to say a lot about its future ! In Love with DSEE ! Photo courtesy of Kent Spaulding, CTO at Skyworth TTG.